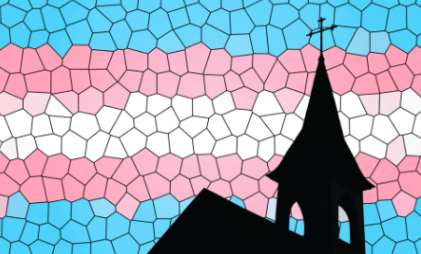 We’ve all seen signs outside religious spaces that read “all are welcome”, but how do you know if a congregation is really trans-affirming? It can be hard to trust that we’ll be safe just walking in the front doors. Many trans people have experienced religious trauma from clergy or family members who use religion to punish us. But as a trans person who freely chooses to participate in a religious community, I believe that all of us deserve an affirming space to express our spirituality. Having support in your spiritual journey can be life-saving. A space where we can feel free to be vulnerable is especially important for trans folks, who struggle to be seen and respected in our daily lives. Lots of religious spaces claim to welcome all, but not many truly put in the work in to affirm and center us. With that reality in mind, here are just a few of the trans-affirming religious spaces in Chicago. Since 2016, Masjid al-Rabia has been offering jummah services and spiritual care for marginalized Muslims in the Chicago area. Named after the first female Sufi saint, Rabi’a al-‘Adawiyyah al-Qasiyya, the community holds prayer every Friday. They also offer a free library of Qur’ans and Islamic texts and work to advance the rights of lgbtqia+ and other marginalized Muslims. Check out Masjid al-Rabia online and consider donating to support their work. Lighthouse Church is led by Pastor Jamie Frazier, an accomplished preacher and a leader at the intersections of theology and social justice. Lighthouse worships in Uptown, and their motto is “Passionate about Jesus. Serious about justice.” July’s sermon series was the Gospel According to Beyonce and August’s sermons will focus on building healthy relationships. Not many churches put lgbtqia+ affirmation right on the first page of their website, but Lighthouse is unafraid to put their beliefs and values at the forefront. Find more info here or, if you can’t make it to worship, you can submit a prayer request here. Metropolitan Community Church, or MCC for short, was the very first denomination to marry same-gender couples, and specifically focuses on affirming theology for queer folks. Any MCC congregation is sure to be welcoming, which takes a lot of anxiety out of a first visit. AChurch4Me meets in Rogers Park every Sunday. You can also join them for open mic nights and other community events if your weekends are full. Read more here about their worship times and beliefs. Luckily, these are just a few of the trans-affirming worship spaces in Chicago. Stay tuned for more, including interviews with pastors and religious leaders, in upcoming posts!